Hans is always confident about his future, knowledgeable, and articulate about the risks involved. He smiled easily and frequently throughout our interview, which started in Lufthansa’s first-class lounge at Frankfort Airport, beside a Maybach Zeppelin, just a few hundred feet away. It is easy to see why he has been so well-likes. It is perhaps not Hans’ skill with an automobile that was unique, but the enthusiasm and spirit that he brought to the sport and to the lives of those around him. "Be all the dog you can be," he said to his new puppy, the newest member of his household. That is Hans’ own essence. Twilight lingered until past nine o’clock, a soft blue glow in the sky with cobalt shadows lying across the fields led up THE HILL. The top branch of the tallest tree caught the last ray of sun from the West: a golden bough turning slowly to black in Freiburg – Schauinsland. Two 14-year-ols German boys had ridden their bicycles 22 kilometers to watch a Maserati win the European Hill-Climb Championship. Now it was time to get home. Young Hans Glaser chatted away excitedly to his neighbor with a face like a plump magpie, acting as if a great weight had been lifted from his young shoulders. Hans knew what he wanted, and knew what he didn’t want. His friend pitied him. He didn’t really mean to, but it was still pity. As they races their bikes back home for dinner, they mouthed the names of Wolfgang Von Trips, Edgar Barth, Heini Walter, Lodovico Scarfiotti. Hans has declared his life’s ambition that day, to muted chorus of "ya, ya… Sure a race driver. A Hill Climb Champion, Race champion, Hans, can’t even win a bicycle race, ha, ha….."
Off they peddled furiously with teeth, hair, and eyes into the wind. The florid-face boy from Freiburg sighed hard and swallowed dry. That moment did not need a signal of approval from his best friend anymore than a flood first needs to break a dam. A spirit had formed; a steady far-off beat of music began its recital. When Hans was only five years old, Oskar Glaser had brought his son to watch the popular mountain championship with those classic uphill battles between the might of Mercedes and Auto-Union. By 1957 there were six qualifying rounds on hills of not less than 6.03 km (3.75 miles), with a gradient minimum of 5%. The Freiburg-Schaunsland (meaning "look into the country-side") measured 7.45 miles long with 125 turns by Hans’ recollection. His father also spoke of the other five. Mont Ventoux 5.3 miles, Austrian Gaisberg Hill and the lesser known Lenzerheide, Aosta-Great St. Bernard and Mont Parnes, all six of which made of the F.I.A. European Hill-Climb Championship. Oskar Glaser often excited his son and his friends with the stirring tales of epic rivalries fought on the mountain climbs between thunderous 600 H/P Silver Arrows and Auto-Union. As many as 140,000 spectators lined the Schauinsland to be stunned by a series of lurid power slides by four and six-wheeled cars. In 1957, young Hans watched the original post-war hill climb, won by Swiss privateer, Willy Peter Daetwyler, in a Maserati. Later, Porsche and Ferrari backed teams would mount serious mountain programs and dominate most of 1960s competitions. Hans remembered Scarfiotti (Ferrari) and Mitter (Porsche) put up brilliant performances. Having been born in the town nearest to the most famous and longest hill-climb in Europe naturally impressed Hans. He recalled, "The drivers all had bandages on their hands because it was so tough going up the hills in those cars. The last race I remember was Bob Bondurant with bandages on the wooden steering wheel of his Cobra. It was a ritual when we were young to go to Schauinsland to the annual big race." After almost 40 years, Hans recounted this memory with a quote from Euripides, "Whom the gods destroy they first make mad." Racing became his all-consuming obsession. The early onset of motor madness. Now Hans’ father was a particle businessman; a manufacturer of road asphalt and tar paper for roofing, He didn’t share his son’s desire to be a driver, but he loved racing. Hans grew up somewhat isolated from his family’s business until a large contract was won by Glaser Industries to pave the new Autobahn! "Every expansion seam and off-ramp needed asphalt on this concrete, high-speed public raceway," said Hans. Oskar was not one to hand the family fortune to his untried heir, nor was our young racing champion eager to be pushed around in business like the little fellow he once was in the family. Early on, Oskar had noticed some of the company cars seemed to mysteriously move from one parking spot to the next. The wheels from one of the plant boxcars disappeared and a soapbox derby racer appeared with beautiful boxcar wheels ! The police began escorting little Hans home in "borrowed Glaser Industry cars". The black fedora, Havana cigar and aviator sunglasses Hans wore to conceal his age didn’t fool the local police. One Sunday afternoon, Oskar discovered his 15-ton Mercedes grading truck and attached trailer were missing. He realized he had to crack down on his 14-year-old with traditional German strict rules and restrictions. From that day onward, Hans never got quite what he wanted from papa, as the masculine test of wills between father and son began in earnest. "It was all a part of growing up and gaining independence," said Hans. "I was not an easy child. My father became very rigid and strict." This seemed to fan the ember of desire to get in the cars and somehow succeed with automobiles. Hans would eventually have the largest fleet of Cadillacs in Germany and a tidy British sports car racing team as well. His automotive career started almost by accident, when he traded an M42 machine gun he found for a 1949 Harley Davidson. The hog needed extensive work, and thus began a restoration business that has lasted almost 40 years. Today, the business is based in Newport Beach, California. Hans recalls that the Harley backfired with such vigor that it used to blow his shoe off!! Because papa and Hans didn’t see ‘eye to eye’ on the little Alfa he’d hoped for, his 18th birthday present turned out to be a flacid DKW sedan, instead. Within his first week as a licensed driver, our future champion had the car full of girls, on two wheels, and heading for a large wall in a very small town. "Not the wall", he remembers yelling. They missed it, and the car came down on all four wheels, only to flip the other way twice and land on its roof. No one was hurt. He righted the car, dropped off the girls, and sheepishly went home to face papa. Naturally, Oskar was very angry. As punishment he refused to replace the DKW. As retribution, Hans drove the repaired and beaten mongrel to the Schauinsland Hill-Climb "totaling" it on the way home. Those were to be the only two accidents he ever had. "I think it was a mental thing," spoke Hans, "I just needed to rid myself of that DKW 1000 with its 55 peewee BHP and oddball 3-cylinder 2-stroke engine." To quote Hans, "Show me a man who has never made a mistake, and I’ll show you a man who never did anything." Oskar was really angry now. The ever-resourceful Hans spoke with his grandmother Margaret about the need for a then new Austin Healy Sprite. It was the start of a lifelong love of British sports cars that makes up a significant percentage of Glaser Motors’ 25 collectable cars now in stock at Costa Mesa, California. Hans remembered more than the car deal with Grandmother Margaret. When he did well in Grundschule (basic school) and went on to Hauptschule (senior school), his grandmother rewarded him with his favorite German syrups such as raspberry, chocolate and cherry ice cream; a full range of German sausages, blanched asparagus, friese with imported cheese served with cool summer drinks. Grandma Margaret grew grapes and peaches, made Irish soda bread, marmalade, dulse and pate-de foie gras. Hans used to sit at grandma’s long dinner table and eat homemade apricot ice cream until he felt the hiccuos. He was guided through the culinary world by this sweet woman who taught him flavors: dried ripe fruit of pimento used for baking and, in seasoning some meat, allspice. The fruit from an aromatic plant of the pungent ginger family is called cardamon; the skin which covers the fuit of an evergreen sold in blades is called mace. Hans is a gourmet by profession and a former restaurateur. Today he happily admits, "We have a generous supply of all style of eateries in a variety of genres in Southern California, both old and new style. They have given me ideas. How about a charming Mexican, French Chinoiserie ?" This knowledge of the highest creative echelon, which includes dishes of tangy marinated wok-tossed chunks of ostrich, serves Hans well as he anticipates opening another Bistro in the South of France (or possibly Brazil). "What I thought about most, I eventually became." As our boy worked with his grandma for the money to buy that Sprite, Oskar provided a replacement for the DKW, a boring Fiat 1500. Hans found himself in the excellent position of waking up in the morning with two cars. "Mind you," said Hans, "the Sprite was great fun for an 80 mph sports car, but it wasn’t an Alfa Giulia either. I used to go to Schauinsland on Sunday morning. By 10 o’clock, you d’ find a large group of sports, big sedan, and Grand touring car ownersracing trough the big turn in front of the stands. What you’d do is take your card down to the beginning of the straight…. You drove as fast as you could into the parabolic, and you wouldn’t lift ……. You never lifted the accelerator pedal," he said with a wink. "You wouldn’t believe how many cars got totaled every Sunday. My Sprite wouldn’t go fast enough to get me in trouble, but this was my first exposure to a future of racing. I suppose you could say I took it one turn at a time. The first turn of that big hill affected the rest of my whole life." Without Oskar’s permission, Hans hatched a plan to trade the Fiat and Austin Healy cars for something in which he could really get in trouble. A seriously fast ride …… a bonafide, 100 mile-an-hour Italian sports car seemed to be just the ticket. Because Oskar’s newly paved Autobahn was the perfect top speed testing ground, every worthy German boy knew exactly what maximum speed his car had. The beloved "Bugeye," the first unitized British sports car with the protruding frogeyes and a 43 BHP engine, would do only 80 mph – not bad for a 1460 pound curb weight car. But, it was not enough for a boy with bulging biceps and testosterone tearing through his eager fingertips to the tip of his serious wood. He remembered his promise to his childhood pal, the one with pink paws and wire rim sunglasses, "You’ll eat my dust, spare tire, tube and all, you’ll see!" Now the Alfa Giulia, with its aluminum block and five-speed all synchromsh gearbox, had an honest 104 BHP and was good for 105 mph. It didn’t warm up very fast. The engine was balky on power when cold, and it lacked good weather protection, all of which precipitated Hans’ jump to a Mini Cooper S by 1965 at age 22. He began racing full time, but his career was not without difficulty. A dispute over his racing activities led to a break with his family that lasted more than a year (however, that breach has since been mended). In his second season of full-year competitions, Hans won a series of Formula III and Formule II events, where he bested Jochen Rindt to win a race at Reims. Hans thus came to the attention of Matra, the French aerospace and sports car firm, which signed him to drive a factory sports car, only to see Glaser’s family intervene, again. They threatened to turn the family business over to a cousin (which eventually they did!). In 1971, Hans began racing in Allgemeiner Deutscher Automobile Club (ADAC) sports car races and won almost every time for a year – a "quite successful" year. He humbly added to this remarkable win record and did not go unnoticed by the racing community. "It was prudent for car company executives to reward young drivers of different countries with factory backing. This sold automobiles in my native land." Than came the dream hatched in the mountains as a teenager ….. a works ride in an Austin Healey 3000. Sixteen trophies later, Hans would get an upgrade to a Lola MK1 and again excellent success with nine wins to his credit. Then he bought a unique Jaguar Coupe, that he still owns. For once Oskar wasn’t mad! In 1954, the men of Coventry were tweaking (what was then well-know sportsman Lofty England’s) XK120 in their endless search for a British Constructor Championship after WWII. "The 1950s presented something of an anomaly for Jaguar," Hans said. Unlike Ferrari or Aston Martin, Jag never won the Sports Car Championship. By 1060, they had five victories at Le Mans to their credit, against Ferrari four wins and only one for Aston Martin. They achieved little in the Mille Miglia and their sports cars were never at home on the Nurburgring, that is until Hans J. Glaser appeared with his Jaguar XK120/140 unique red coupe. This big cat was a rolling test bed for the Jag works and Dunlap Testing Division. It was the only XK120 with four disc brakes. As such, it was able to hang with the very fast crowd, the SWB Ferraris and Zagato-bodied DB4GT Astons. With the Jag, Hans upset the establishment. He so soundly trounced the Italians in vintage races at Zolder, Nurburgring, Spa and at the little Bugatti, and full circuit at Le Mans, that he became very unpopular with tech inspectors who were under great pressure to prove the car illegal. It wasn’t. Along the way to the winners circle, and while collecting 68 trophies, the "Red Baron" of VARA has garnered appropriate respect from his European competitors. 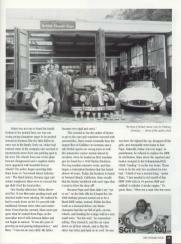 Hans and his straight six Jaguar have been invited to the 50th anniversary of the XK120 at Donington Park race circuit, on June 25, 1998. With plans for shipping the car to the UK by ocean liner, Hans, whose car is featured in the race brochure, will once again avenge his title as the fastest "Jag Man" in Europe. Fast forward to the present: seldom a month passes without a call or an order from Germany to Glaser Motors to build an endurance vintage racer. He has prepared two GT40s (which ran VARA's Phoenix race in February), a rally car (a Mustang GT which raced Panama to Alaska in 1997), a V-12 (yes V-12!) XK120, and a Lolo center seat Can Am car, to name a few. The list is long and the range of machines impressive, including his D Jag seen at Pomona. As clichés go, "Teutonic thoroughness" has probably been used more often than any when describing aspects of either the German national character or details of a German automobile. In this case, Hans continues to make history for his venerable old British Jaguar Coupe. Perhaps the only real flaw in this story is the "Old Cat" from the United Kingdom of all places. It seems out of character. The Ferrari contingent at Le Mans in the vintage 1000KM GT race in 1972 still remembers Hans Glaser. He began upset the world order that day. He has over 400 on-track events to remember, 409 to be exact, and a 38% podium finish rate. For a perspective on this record, consider Stirling Moss. He started 494 events and won 222 of them. In the vernacular of baseball, Moss would have a lifetime batting average of .449. Hans is a major leaguer with a .380 average ( a .300 average is solid evidence you can swing the big wood.) True baseball fans will tell you that not since Ted Williams, 57 years ago, has anyone had a .400 batting average. Moving to Southern California in 1981 and starting racing with VARA in 1983, Hans has answered his 84th green flag in the USA at Phoenix International Raceway with VARA in February. "I respect those who manage VARA’s direction year after year. Fred Orgeron, Nick Nicholson, Jay Dettinger. I cab relate to Cris Vandagriff’s job, after having founded the Fahrrgemeinschaft Historischer Rennsport (Driver’s Organization of Historic Racing) in the late 1970s. Cris does a tremendous amount of work, for modest rewards in the face of continuous critics. Ah, it’s so easy to be a judge, to play prosecuting attorney and so difficult to do all the work, in the face of that pressure from others; meet all the deadlines, and still maintain understanding with grace an dignity, and then offer leadership and guidance and work with the sponsors." Scheduled for completion in 1998, is a "wire-wheeled" lightweight E-type Jaguar. His plan is to drive to VARA races, run his Jag, and motor on home to the serenity of Costa Mesa with his beautiful friend Margaret. "The E type should be the end of my childhood fantasies that were so thwarted by that dumb DKW. "E jags" are so gorgeous, sleek and quick, surely the opposite end of the scale from a DKW." Now that’s an understatement! The rhythmic snapping of huge propellers beat the morning air as the gigantic silver airship beside us gently surged upward. Slowly, gracefully, the zeppelin slipped through vapored mists and disappeared into a new day. Its five engines thumping a steady beat that still lingers in the morning light. Our interview is at a close, and so ends the story of little Hans and his climb. This healthy, vigorous driver, restorer, entrepreneur and restaurateur can be found in Newport Beach, California. Oh yes, that little magpie faced kid. You remember him, Hans’ 14-year-old friend. That boy’s parents died under Allied bombing in 1943. He was brought up by his grandparents and took his place in the family spice importing business after leaving school. His interest in motor sport found expression in 1962 in a Simca Montléry saloon, and later in a Formule I Ferrari. That was none other than Karl, later known as Jochen Rindt. Perhaps thus suggests that you’ve not always known by the company you keep, but in racing it’s good to be in fast company.